I'm addicted. I can't help myself. About a year ago, I started making my own cleaning products, like streak-free window cleaner, electric dishwasher soap, and laundry soap. 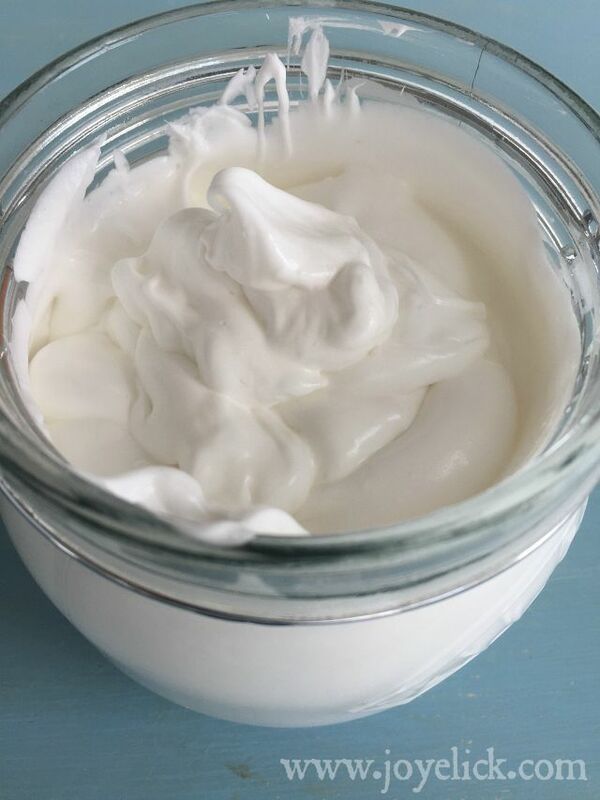 Now I can't stop transforming everything from the laundry closet to the medicine chest and bathroom cabinet into homemade, all-natural, toxin-free zones. The truth is, it's exciting when you learn to make your own necessities. When I want to replace a store-bought product around here, you'll find me hanging out for hours in my "other kitchen" keeping notes until I'm satisfied. (We're still remodeling an old duplex into a single family home, so I have this funky "project kitchen" to play in for now. It's kinda weird and cool all at once). I get a thrill out of each product I get to stop buying at the store. You'd be surprised how easy it is to concoct pretty much whatever you need from just a handful of basic ingredients, and all for cheap, cheap, cheap! But what I love better than the money saved, are the toxins I'm able to wave good-bye to each time. So I press on making things like toothpaste, roll-on deodorant, lip balm, and today's creamy shaving soap. It has to work as well or better than store-bought. It has to be easy to make. I'm not one to fuss too much with a complicated recipe (or I'll be tempted to head right back to the store). So I really try to keep things simple. It has to be frugal and save me (and you) money. It has to be all-natural and toxin-free. This is actually number one, now that I think about it! So how does today's DIY recipe add up? Five out of five, folks! Who-hoo! You're gonna love this shaving soap. Just wait 'til you see how smooth and lathery it is for a super close and comfortable shave. And it smells soooo good! (Delicious enough to eat, but just for pretend, okay)? 1 cup Dr. Bronner's almond liquid castile soap (or your choice, but almond is fab)! STEP 1: Combine all ingredients in the stock pot and cook. Heat over medium-high, stirring slowly and consistently until a plume of foam reaches to just below the rim of the pot. (Watch carefully! This only takes a couple minutes). Turn off heat and remove the pot to an empty sink (in case it foams over, which I've had happen and it's rather a mess). STEP 2: Allow the mixture to cool for about 4 hours. As it cools, the plume of foam will shrink down to a sticky thick crust with a shallow watery substance separated and hanging out at the bottom of the pot. STEP 3: Scoop the solids into a bowl. Using a slotted spoon, collect the sticky mass of solids into the small mixing bowl. Discard the leftover watery substance that remains. (This substance has lost it's poop and it isn't good for much. I tried using it on dishes and the result were sad. Somehow, all the soapiness and lathering action is captured in the thick paste, so what's left is anti-climatic). STEP 4: Whip it. Place about half of the cooled mixture into a wide-mouthed pint-size jar. 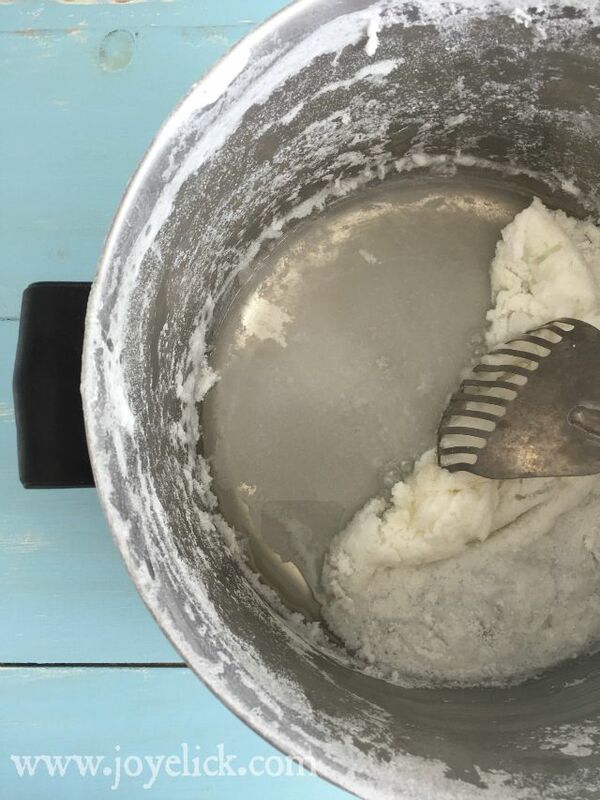 Using the stick blender, whip the mix, moving the mixer up and down until you have a thick, rich cream that looks like something you'd glob onto a dessert. 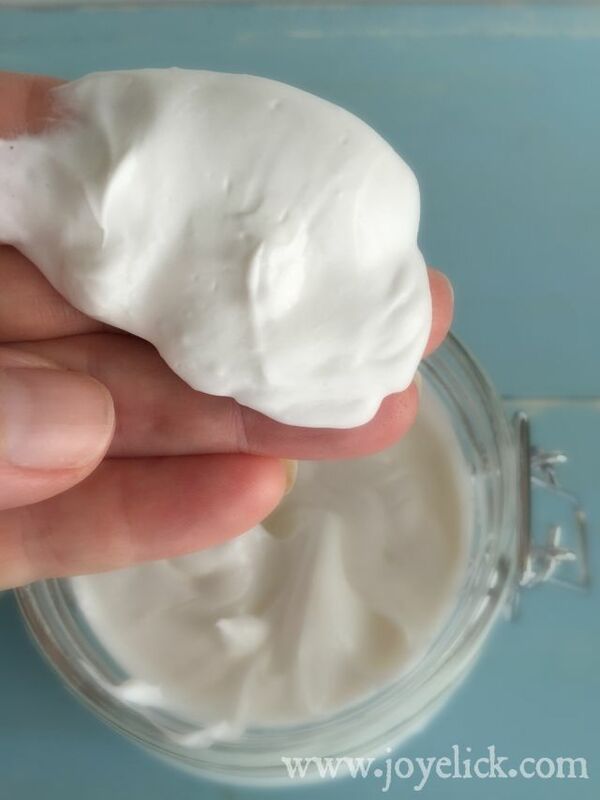 I like to use the stick blender and pint jar this way, because it just seems to work best for creating the right texture (very much like traditional shaving cream). The stick blender also makes for easy clean up. STEP 5: Store and enjoy. 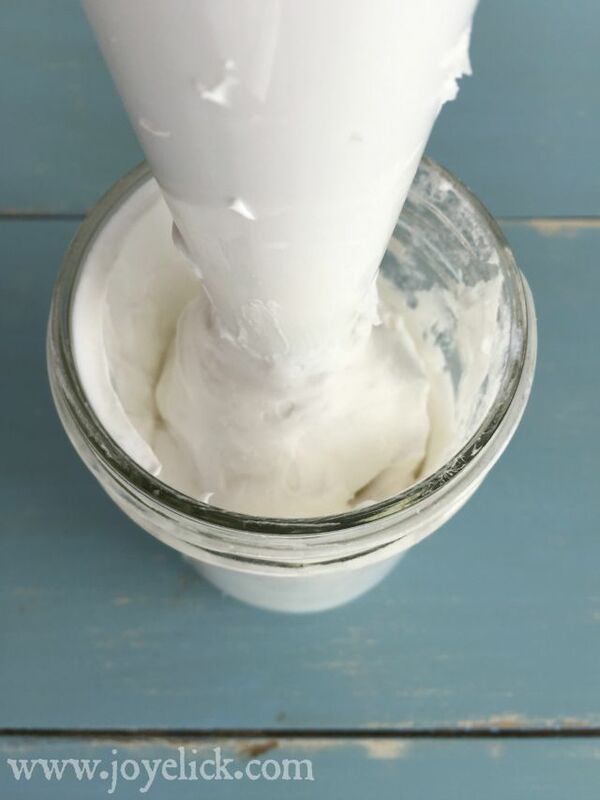 Store your shaving cream in a separate pint-size jar, or the same one you used for mixing. You can keep your jar of shaving soap in your shower, but keep it sealed when not in use so it doesn't dry out. It's best used within two weeks, but it will last much longer. Over time, it may settle and become a bit stiffer than at first. You can try swiftly stirring it up with just a finger (you may be amazed at how well this creams it up again). Or you could simply give it another whiz with the stick blender to make it good as new. How do I use this shaving soap? In the shower, spread onto wet skin, rubbing briskly to work up a nice thick lather and shave away! Is this shaving soap good for both men and women? Well, that depends on how you like to shave: wet or dry. I like to shave in the shower. Wet. I love the way my legs feel after shaving with this cream. My husband, on the other had, shaves at the sink. Dry. He gives this a thumbs down when used in the dry application. However, my adult son who likes to shave wet in the shower, gives this cream two thumbs up. Bottom line, it works best over warm wet skin where there's enough water present to work up a good foamy lather. This shaving soap is so lathery, can it be used as body wash too? Yes. Body wash, face wash, it's just soap that's super creamy and sudsy, so feel free to use it all over (I do). In fact, the baking soda can actually sooth skin and balance pH. Have more questions or comments? I'd love to hear from you in the comments below! 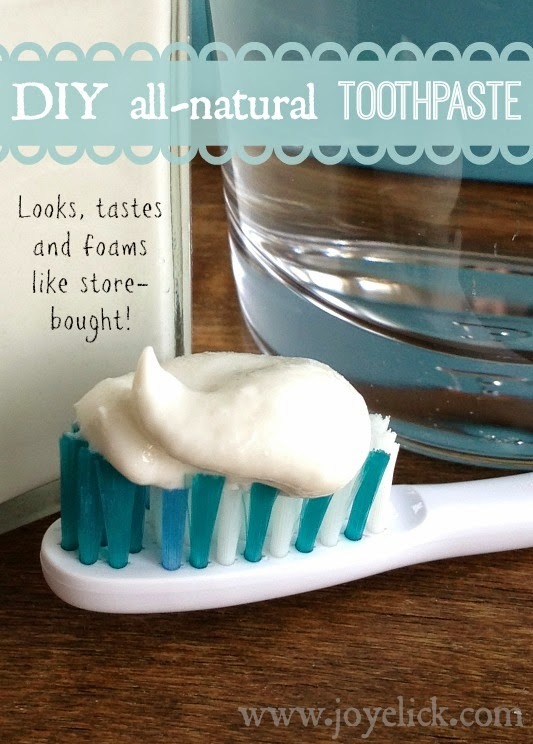 DIY TOOTHPASTE so good, you can brush aside the store-bought stuff and never miss it. Best DIY ROLL-ON DEODORANT (Works like crazy)! Fast, easy PINK LEMONADE LIP BALM. DIY vanilla-bean SUGAR SCRUB: Feel the youth emerge in your skin. Ok I am inspired and am going to try this! I think I can do it! Thank you for sharing! I hope so it will works perfectly! I want to use this as soon as possible. By the way, me and my brother will try this. Thanks for your post. I will let you know if I will get any good experiences. I only have liquid castile soap. Do you know how much soap I would use? Hi. 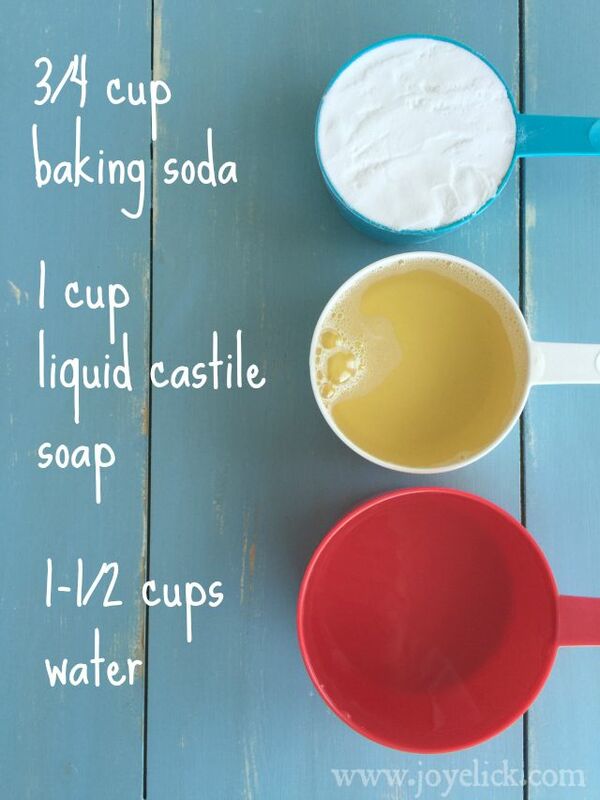 This recipe calls for 1 cup of liquid castile soap. Hi Debbie. The stick blender helps create the perfect consistency, but I think you could use hand mixer, too. Let me know how it works! If I wanted to use a preservative for this, how would i go about it? I would love to try this, but I would need it to last longer than 2 weeks at a time, especially if I wanted to give it to friends and family.. Thank you! It sounds lovely! Hello Leialoha. I'm sorry, but I don't have any suggestions for preservatives to use, as I try to avoid these in my homemade products. I'd like to encourage you to try making this without any preservatives. It does last much longer than 2 weeks, but may need to be stirred now and again. Good luck! As long as you keep everything clean before and during the process and use distilled water (sterile), whatever preservative natures the castile soap already has should be preserved. Does this come out gritty and abrasive even after blended. Because that's my only problem. The grit is irritating my skin. Am I doing something wrong? Hi there. Did you use a stick blender? I find the stick blender works best for creating the creamiest consistency. Mine is not gritty, at least not noticeably. I lather it up first with water on my hands in the shower then apply. As far as your skin feeling irritated, you may be sensitive prolonged exposure to baking soda. Sometimes, if you use baking soda regularly on your skin, it can change the pH of your skin and cause irritation. 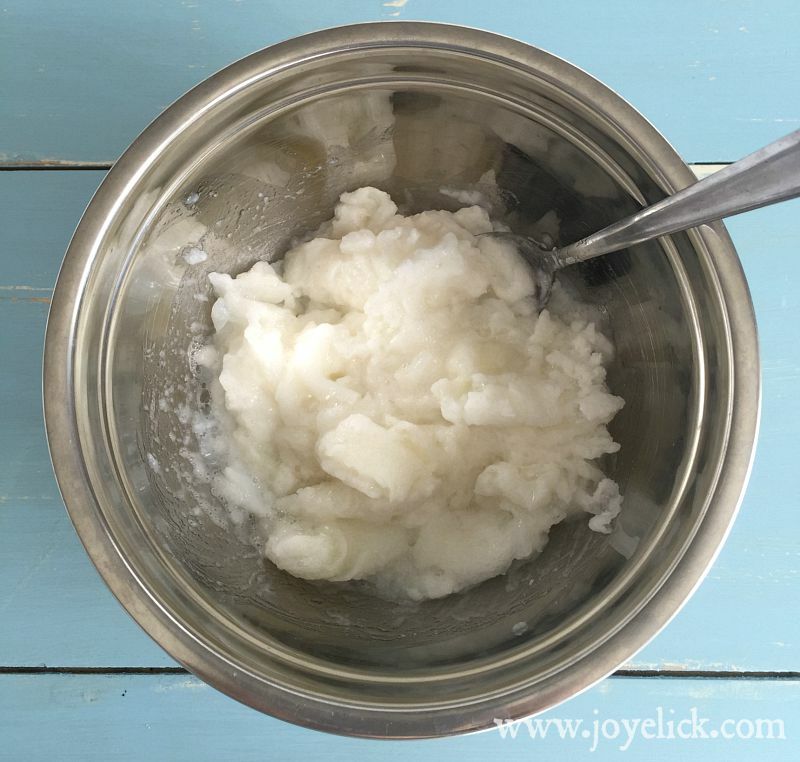 Have you ever added tallow for moisture? Great question! No I haven't, but it would be worth a try. If you do it, let me know how it works out. I'd love to hear back. 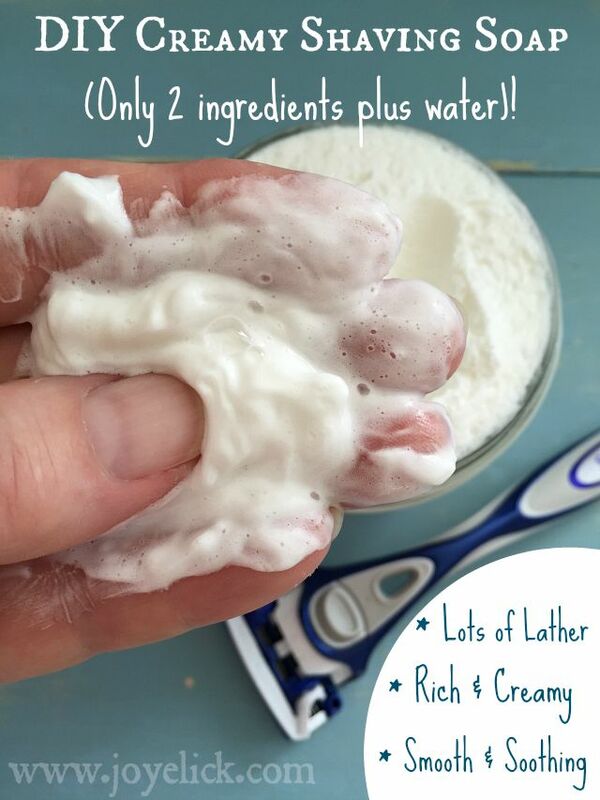 How much shaving cream does this recipe yield? This recipe yields approximately 2 cups of shaving cream. Hi, thanks for your question. This recipe lasts for many weeks! Could I add a couple drops off essential oil? If so, how many drops would you suggest? Hi Ginger! A store brand is probably fine. As to the whisk, give it a try (but I think you will want a mixer of some sort for the right consistency). Best of luck! Thank you. I will see how it turns out. Men's shaving products are particularly sought after since a lot of men shave and want to find that product that makes the whole process easier. 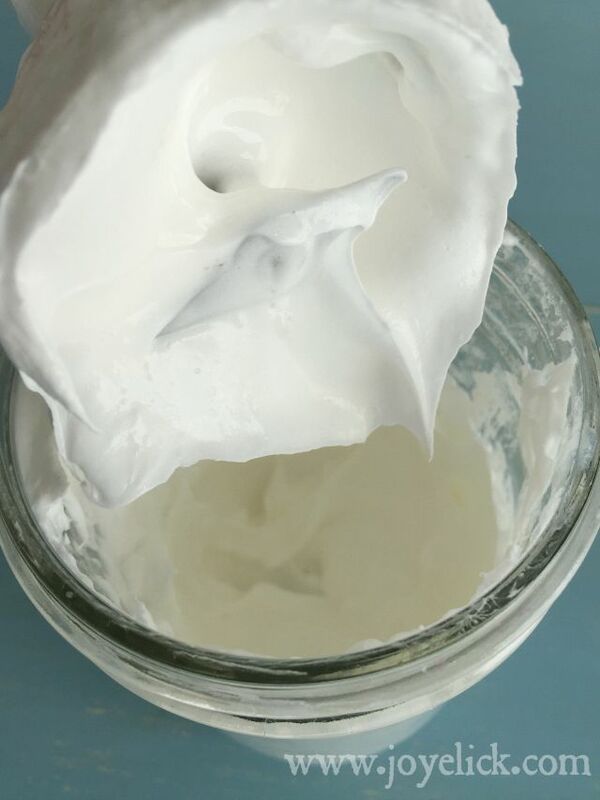 The recipe for a cream soap is very simple and fast. The combination of two ingredients in the right proportion will yield the unique product. IT's good yet time consuming. We can easily buy good shaving cream at affordable price. If you like efficiency and reducing waste, try double edge shaving instead of cartridges too! Wet shaving is a basic and simple process that everybody can, and ought to appreciate. In this article, I'll reveal to you what wet shaving is, and isn't, and how you can start getting a charge out of the advantage of wet shaving today! Soap and water is really good to clean a lot of things these days! And you don't have to worry about harsh chemicals! I try not to do fad diets. 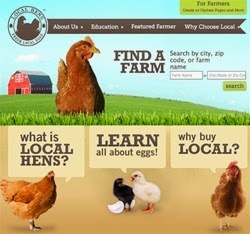 There are some good recipes on here, thanks!